Guys, I bet I am not the only one to get excited when I plan to go on a road trip. Road trips have this romantic halo around them. There’s something magical about hopping in the car and just taking off. You can go everywhere you want and ultimately you get this great feeling of freedom. Until it gets boring! This is the point where trail mix joins the party! There are a few things that make every road trip instantly much better. Call them road trip essentials if you want. Good company is one of them. The right music should not be missing either. But the most important for the travelling foodie might be the right choice of snacks. 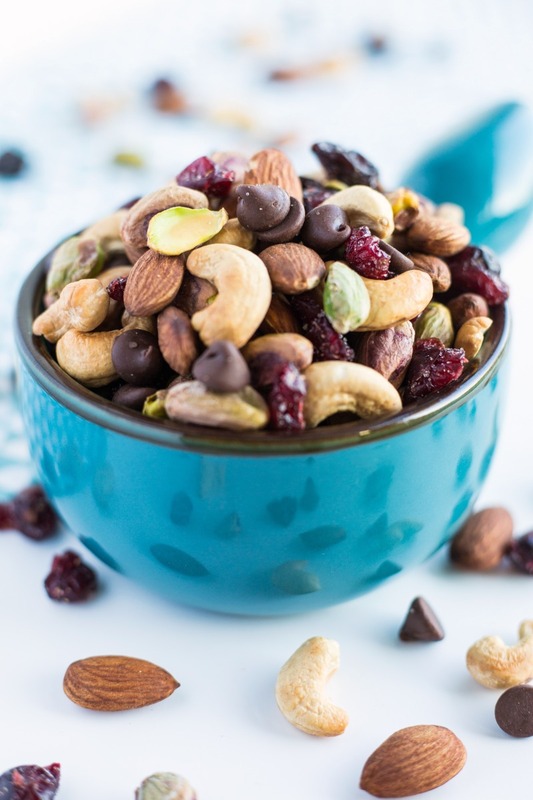 This Sweet and Salty Trail Mix ticks all the boxes of an awesome snack. You might know that when it comes too food I always enjoy the things most that bring variety. I like things that are sweet and salty, crunchy and chewy, crisp and soft. This trail mix has it all. For the last three summers Stefan and I have been road tripping through the USA. On the very first day of having our rental car that first summer we hit a Trader Joe’s to stock up on some snacks. And I was blown away by the variety to choose from when it comes to trail mix in America. In Germany we have trail mix, too but it usually consists of 40% raisins, 40% peanuts (aka the cheap stuff) and 20% a mix of other (more expensive) nuts. To be honest it’s a bit disappointing. In America not at all. What blew me away was not so much that there are different kinds of trail mix available but that every single one we tried had a balanced amout of ingredients. Sure they are a bit more expensive than the one in Germany but I’d say it’s totally worth it! Anything that makes being trapped in the car for hours more enjoyable is worth the extra buck. Am I right? So as we have a few road trips planned for the next weeks in Germany I realized that I have to take action and make some awesome trail mix available in Germany. Obviouslyls I made sure that this Sweet and Salty Trail Mix definitely has all the good things in equal amounts. A sweet and salty, crunchy and chewy trail mix with all the good ingredients in equal amounts. A healthy snack for every road trip or anytime if you fancy something delicious! 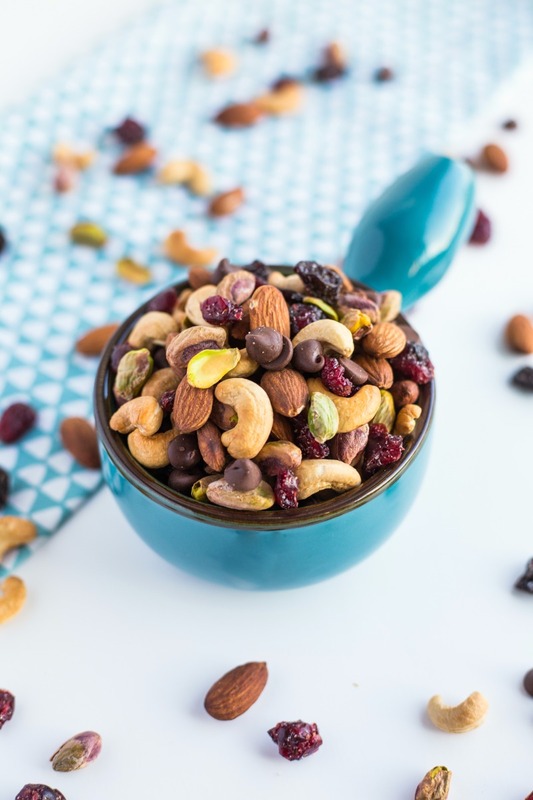 Are you a fan of trail mix? 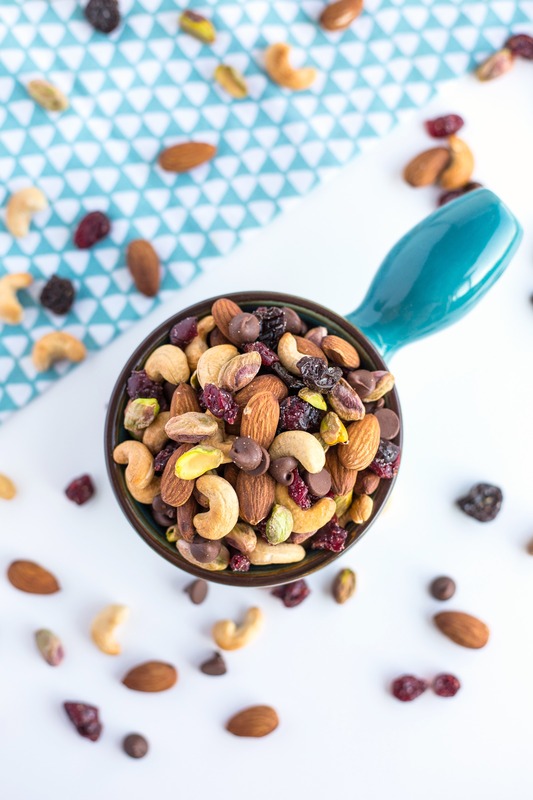 What are your key ingredients for a good trail mix? That dish is way too cute! Where did you find it? Also, you should start selling your trail mix[es] because agreed, we lack variety over here. This mix is right up my alley – especially with the pistachios in there, too. I got it in Toronto – among a couple of other completely necessary kitchen utensils much to the dismay of my husband. If I ever start selling trail mix I should look into finding someone to crack open those pistachios for me. Or find a good brand that sells them without their shells!